A great hunting round for rifle shooters that is also accurate enough for strategic target use and precision match shooting in the .308 Winchester caliber from factory. This is the Fiocchi 165 grain load that features a Sierra game King projectile that is in the boat tail hollow point profile. The legacy of the Sierra Bullets company is legendary, with the Sierra Match King and Game King being the obvious choices given their history, capability and quality controls. This is a 1MOA cartridge and could easily be pushed to a 1/2MOA with the right conditions and hardware. 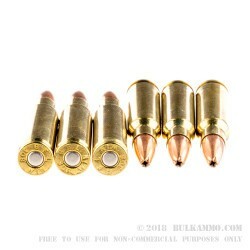 This round offers a spectacular value for those who actually need the accuracy and the speed of this particular load. In the entire spectrum of .308 it is moderately priced, which makes it an exceptional value for those who can benefit from the inherent accuracy of the build. Fiocchi has put themselves in a position to easily manage their production, and it is allowing them to move into more of the specialty rounds that allow for different components from different top tier producers. 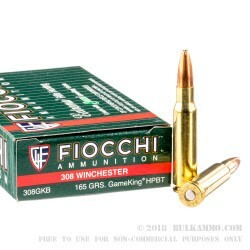 While Fiocchi could easily produce this cartridge with 100% Fiocchi components (and they do) they can also save shooters a ton of cash on a top tier collaboration like this with Sierra projectiles. 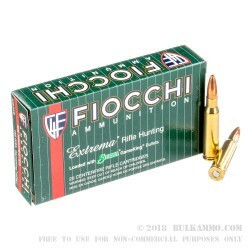 I just fired 20 rounds of this ammo at our local 100 yard range. It made a decent shooter (me) look like a much better shooter. Clean, accurate, low felt recoil. Love it! Q: I have an 1895 Mauser, converted from 7mm to 7.62 Nato. Can it handle .308 rds? A: Those 1895 Chilean Mausers are cool and unique rifles. 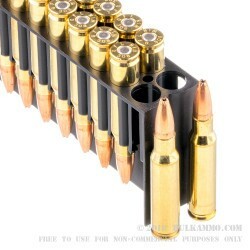 Unfortunately, it is not safe to fire commercial .308 ammunition through them. Q: So I watch gun and shooting programs on TV and they set up watermelons or pineapples or some other fleshy fruit and shoot it. Sometimes the bullets go right thru with just a small hole and sometimes they explode in a rain of fruit juice and this is out of the same gun. Thus, it must be the ammo, yes? Is this the type of ammo to make a watermelon explode? A: This ammo is designed for weight retention and expansion in animals with thicker skin and heavier construction than watermelons. It is not likely to make a watermelon explode.